Naujac-sur-Mer is a village about 54 kilometres north-west of Bordeaux about halfway between the town of Lesparre and the villages of Hourtan. The village is on a by-road turning west off the main road between these two places. The communal cemetery is situated behind the church. In the far corner, east of the entrance, is the grave of a sailor belonging to the Royal Navy; and south-east of the entrance rest five airmen of the Royal Air Force and two airmen of the Royal Australian Air Force. Outdoor Group portrait of No. 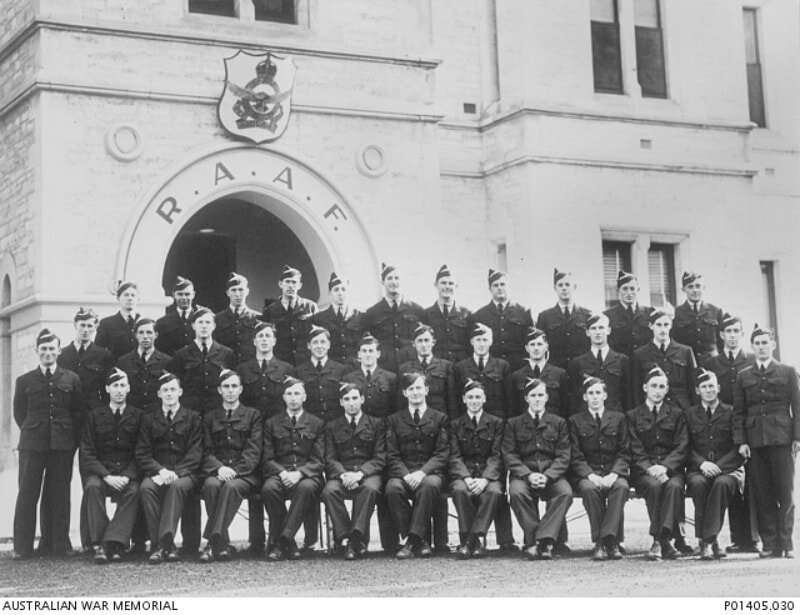 4 Initial Training School, RAAF, Course No. 27, B Squadron, Flight 9. Identified in the back row from left to right: 417336 Aircraftman 2 (AC2) Ian Douglas Chalmers (later Warrant Officer WO)); 417327 AC2 George William Bateman (later Flight Sergeant (Flt Sgt) and died on flying operations over France on 25 June 1944); A C Cameron, probably 415923 AC2 Anthony Carlyle Cameron (later Flt Sgt and died on flying operations over France on 5 November 1944); 417334 AC2 Colin Alexander Byrne (later Flight Lieutenant (Flt Lt)); 417332 AC2 James Vincent Seaton Bowen (later Flt Lt); 410946 AC2 Gordon Roch Campbell (later Flying Officer (FO) and died in an accident in the United Kingdom on 4 December 1944); D Cameron, possibly 415934 AC2 Donald Cameron (later Flt Lt); 417328 AC2 Charles Nevil Ker Bell (later Flt Lt); 410949 AC2 Ronald Ross Carter (later Flt Lt and died in an accident in the Philippines on 11 October 1945); 417335 AC2 James John Campbell (later Flt Lt and died on flying operations over Germany on 21 February 1944); and 410934 AC2 Walter Joseph Adams (later Flt Sgt and died on flying operations over Germany on 31 March 1944). Second row from left to right: 410936 AC2 Keith Fowler Allen (later Flt Sgt and died on flying operations over France on 12 March 1944); 410939 AC2 William Arthur Bennett (later Leading Aircraftman (LAC)); 410937 Alan Charles Alpass (later FO); 410945 AC2 Kenneth Roy Caldecott (later FO); 410948 AC2 Alexander Francis Cargill (later FO); 418020 AC2 John Robert Brown (later LAC); 417324 AC2 Allen James Agnew (later WO); 410950 AC2 Frederick Nicholson Chapman (later FO); 410938 AC2 Kenneth Melville Annett (later Flt Sgt); 410942 AC2 Sydney Harold Brasher (later FO); 410940 AC2 Hugh Melville Bissell (later FO); and 417333 AC2 John Raymond Burton (later Flt Sgt and died in an accident in the United Kingdom on 20 October 1943). Front row from left to right: A Campbell (standing), possibly 415924 AC2 Arnold Campbell (later FO); 417330 AC2 Harold William Bird (later Pilot Officer (PO) and died on flying operations over the Netherlands on 17 June 1944) (sitting); 410941 AC2 Frederick Clifford Boyce (later FO and died in an accident in the Middle East on 24 December 1943); 417325 AC2 Ralph Douglas Anderson (later PO); 410947 AC2 Stanley Edward Carey (later PO and died in an accident off the coast of Victoria, Australia on 2 July 1943); 410951 Henri Hyam Ciddor (later FO); Sergeant B D Hoffman; 417326 Clifford Stanley Ball (later Flt Lt); 417331 AC2 Jack William Robinson Boanas (later Flt Sgt and died as a prisoner of war at Ambon (present day Indonesia) on 31 October 1943); 410952 AC2 Geoffrey Reginald Clarke (later FO); 410935 AC2 Jack Shaw Alexander (later Flt Sgt and died in an accident at Sale, Victoria on 17 November 1943); 417337 AC2 Arthur Raymond Christian (later FO and awarded DFC); and 417323 AC2 Douglas Whinnen Abbott (later WO) (standing).